To become a part of my daily haircare routine, a product really has to stand out. I've been wanting to switch things up lately so I decided to try some products by Tigi. I can't believe it's taken me this long to try this brand, I really wish it hadn't taken me so long! I wanted to try things that would help my routine every day so I chose the Tigi Blowout Balm for frizzy hair and the Your Highness Firm Hold Hairspray. I definitely found new favorites. Blowout Balm | After I wash my hair, I always use a serum or balm to help reduce frizz, smooth and protect my hair from heat. This blowout balm really exceeded my expectations. It's lighter than my typical serums but still goes a long way to keep my long, thick hair smooth, shiny and frizz free. The formula is almost like a thin gel but isn't sticky or heavy. There isn't even residue on my hands after application, which I love. It comes with a pump so you get just the right amount each time. I also love the light scent, it's a little fresh and a little sweet. 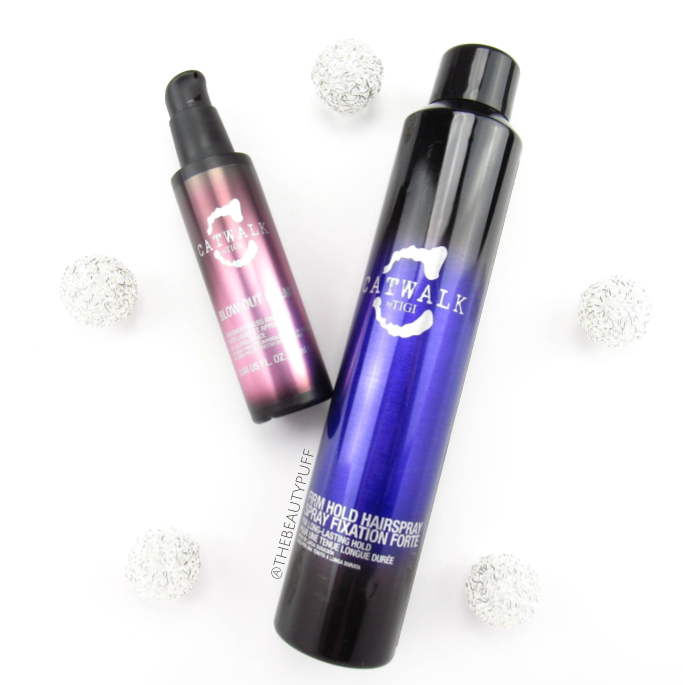 Your Highness Hairspray | To finish my style, I've been using the Catwalk Your Highness Firm Hold Hairspray. This hairspray is made with lavender, jasmine, violet and wisteria which help protect hair. There is also a UV barrier which helps protect hair from the sun. The formula isn't sticky or stiff and the nozzle sprays an even, fine mist every time. Two things I struggle with this time of year are static and frizz and this hairspray helps with both! I love that this hairspray is such a multi-tasker and it still doesn't feel like I have heavy product in my hair. Definitely a win win for me. If you're looking to incorporate some new products in your haircare routine, I highly recommend checking out the Tigi line. You can find them on Notino's website below.